Are you tired of picking up maps that you look at, but can never fold back up the way it was to start with? Then our maps are perfect for you. These maps are full color and detailed. Our maps are also inexpensive and the low, one-time price that you will pay covers you for the entire year (NO HIDDEN CHARGES). We feature businesses of every shape and size. Our main goal is to bring as much business as possible to our patrons. These maps are placed throughout the community where they will get the most traffic. 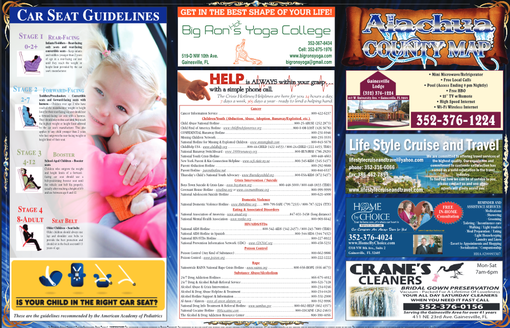 The maps feature the city or county map on one side, and all the advertisers get prime space to showcase their business on the other. What better way to get your name out there but on these full color maps. Our spots on the map are limited so if this is a place you would like to see your business, Contact us TODAY ! There are endless ways to get YOUR name in front of the public. Why should you choose to advertise on our maps? Easy, let me show YOU! An advertisement on our map is a very effective, low cost vehicle to get your name in front of prospective customers. Economical value; because of our competitive pricing in the advertising specialties market, a few pennies per day give you coverage for an entire year. Long-term exposure for a one time charge. A variety of businesses, your neighbors and associates, use and distribute our maps. This networks you with thousands of customers in your target area. Maps gain name recognition, one of the most important features of advertising. You receive maps to give as a thank you to your customers. They appreciate that and are likely to return as repeat customers. Map advertising is an effective way to target those you are trying to reach, as well as, a means to broaden your customer base. Maps are a non-disposable form of advertising. 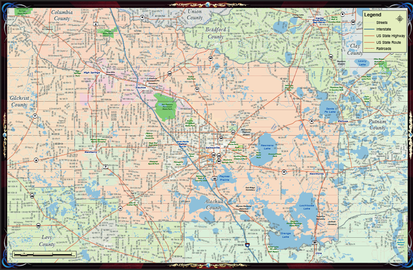 People use maps over and over, with your ad visible to the customer at all times. Maps are used by newcomers to the area, who may need you! Why not have your ad right there on the map? To find out more about this exciting publication and get YOUR name on the next edition, click HERE to Contact Us !